Founded in the 1700s, Wat Mahathat is a national centre for the Mahanikai monastic sect and houses one of Bangkok's two Buddhist universities, Mahathat Rajavidyalaya. Every weekend, a large produce market is held on the grounds. Opposite the main entrance, on the other side of Maharat road, is a large religious market selling amulets, or magic charms. 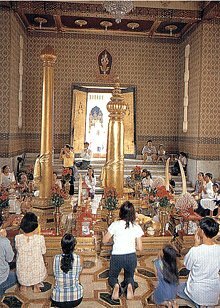 The temple is open to visitors from 09.00 to 17.00 hours everyday and on Wan Phra Buddhist holy days (the full and new moons every fortnight). Also in the temple grounds is a daily open-air market that features traditional Thai herbal medicine. The unusual Wat Ratchabophit was built, with very elaborate decoration, around 1870 by King Rama V. The mother-of-pearl doors and window of the Bot are especially refined, and the handpainted tiles clearly show European influence. 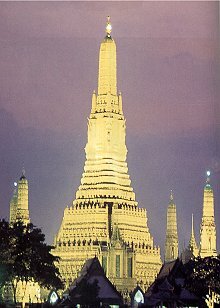 The temple of Dawn or Wat Arun is named after the Indian god of dawn, Aruna. It appears in all the tourist brochures and is located on the Thonburi side of the Chao Thraya River. 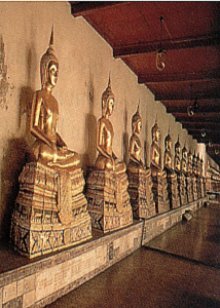 King Taksin chose this 17th century Wat for his royal temple and palace, as it was the first place in Thonburi to catch the morning light. The Emerald Buddha was housed here after it was recaptured from Laos, before being moved to Wat Phra Kaeo in 1785. 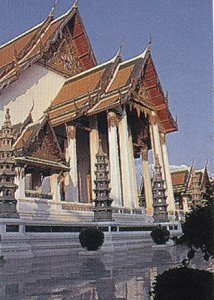 Even without the sacred statue, Wat Arun continued to be much revered, and the kings Rama II and Rama III reconstructed and enlarged it to its present height of 104 metres. Today, Wat Arun has a long, elongated, Khmer-style, prang, the tower, and four minor towers symbolising Mount Meru, the terestrial representation of the thirty-three heavens. The Prang are covered with pictures of porcelain, which Chinese boats coming to Bangkok used as ballest. San Lak Muang or the City Pillar is across the street from the Eastern wall of Wat Phra Keao, at the Southern end of Sanam Luang. This shrine encloses a wooden pillar erected by King Rama I in 1782 to represent the sounding of the new Bangkok capital. 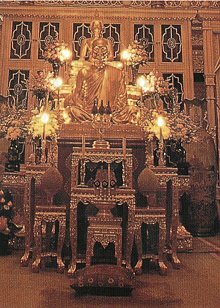 Later, during the reign of King Rama V, five other idols were added to the shrine. The spirit of the pillar is considered to be the city's guardian deity and it receives the daily supplications of countless Thai worshippers, some of whom commission classical Thai dancers to perform at the shrine. 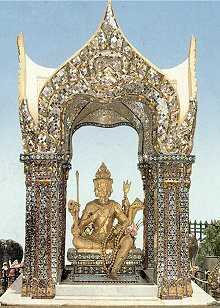 San Phra Phrom or Erawan Shrine was created as a spirit house connected to the Erawan Hotel, which has now made way for the Grand Hyatt Erawan Hotel. The forces of this typical Thai spirit house didn't seem effective enough during the building of the hotel, so spiritual persons advised that it should be replaced with the four-headed image of Brahma or Phra Phrom in thai. There have been no further hitches since.